After reading several Modiano novels, I decided to take a break, but a recent foray into the TBR stacks led to me selecting So You Don’t Get Lost in the Neighborhood. This is a short novel (my copy runs just over 150 pages) and it’s a typical Modiano novel concerned with memory and identity. 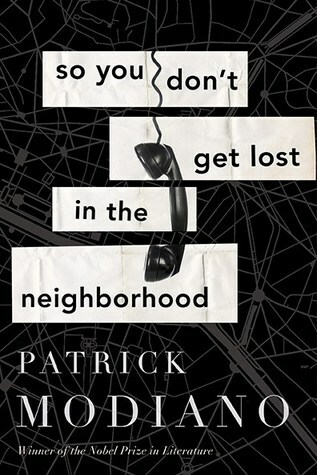 The book opens with a strange phone call to the protagonist, Jean Daragane. We are dropped into Jean’s isolated life with no explanation, and the phone call (it’s the first time the phone has rung in months) is from a man who says he’s found an address book that belongs to Jean. The man, Gilles Ottolini, insists on meeting Jean to return the book, and there’s something here that makes Jean uncomfortable. Gilles has a slightly threatening manner, and he’s certainly pushy, but then again perhaps Jean, who isn’t used to human contact, feels that his space and privacy is invaded. The two men meet and it soon becomes clear that Gilles wants something from Jean. Gilles begins asking about a name in the address book, a “certain” Guy Torsel, but Jean has no memory of the man that belongs to the name, and a glance at the outdated telephone number in the address book “means nothing.” Gradually over the course of a short time, Jean begins to recall, slowly, how he met Guy Torsel and the significance of the man and a circle of other long forgotten people. Gilles and a young woman begin to penetrate (invade) Jean’s life. There’s a surreal quality here as Gilles hints that Jean knows more than he’s letting on, and Jean seems to have no idea what Gilles is talking about. Of course all the answers lie in the past, and the path to the past is through memory. As Jean’s memory gradually peels back time, details emerge from the forgotten recesses of his mind, and this is where the novel is strongest. These words had travelled a long way. An insect bite, very slight to begin with, and it causes you an increasingly sharp pain, and very soon a feeling of being torn apart. The present and the past merge together, and that seems quite natural because they were only separated by a cellophane partition. An insect bite was all it took to pierce the cellophane. Jean has forgotten chunks of his past and along with those memories, he’s also let slip thoughts of people he once knew, people who inhabited Jean’s life, or perhaps passed through briefly. There’s a point at which Jean tries to search on the internet for people from his past, but he can’t find them. The rare people whom he would have liked to trace had succeeded in escaping the vigilance of this machine. They had slipped through the net because they belonged to another age. Modiano’s approach to memory is fascinating. He chews over this subject, noting every nuance, every angle, every sensation. Rather uncannily, I recently came across an old address book, and found a name or two I couldn’t tie to anyone I remembered. For a brief moment, I thought I was living in a Modiano novel. The author certainly nails the descriptions of memory, shards of memory, and how sometimes, in order to remember, we have to burrow into a time and a place that have long since been forgotten. Still at the end of the novel, I was left wanting a bit more plot. On a final note, remember that Hemingway parody contest? Not to denigrate Modiano, but has anyone heard of a Modiano parody contest? In the end we forget the details of our lives that embarrass us or are too painful. We just lie back and allow ourselves to float along calmly over the deep waters, with our eyes closed. This is one of my favourites of the ones I’ve read – funnily enough, I thought it actually had a lot more substance than many of the others! Yes it has substance compared to some of the others I’ve read. I want more though, but then I get into character driven novels. That was my fav. so far. Haven’t read this one, but it sounds so typical of Modiano. Confusion, faulty memory, strange menacing people. His books are always short, but I think would make great films in shadowy black and white. Yes they would, but the resolution is always problematic (film wise). A creative script writer could see to that. If someone were to try Modiano for the first time, where would you recommend to start? Depends. I wish I’d saved Villa Triste. I’ve read a lot of him and liked most of them but thus sounds really good. I hope it’s on my piles somewhere. This is the only Modiano I’ve read so far. I liked it—it reminded me of Auster’s work. I certainly intend to read more by him. Despite all your good reviews, still not tempted to read another one by him. He’s good, obviously, just not for me. I read one and then think that’s it for a while. Don’t want to OD on him. I can’t imagine the obituary linked to death by overdose of Modiano. “He will be remembered but with how unreliable memories are, who knows what will remain of him and how faded the memories will be and also some will forget but might remember later thanks to a letter”…. And there’s your entry into the parody contest. If one existed. There must be one. There are contests foe everything.